I love a good conservation success story and Michigan has several: Wolves are returning; bald eagles are plentiful; wild turkeys are everywhere; and elk are just fine. But, none warms my heart so much as the Kirtland’s Warbler comeback. The diminutive bird that inhabits the jack pine forests of northern Michigan has now recovered from the brink to such a degree that government agencies and non-governmental groups are talking about taking it off the federal Endangered Species list. They are also discussing what should happen after that. Observers participating in a recent Kirtland’s Warbler survey found 2,004 singing males; each typically signals a mating pair. That is fewer than 2012 when 2,063 singing males were seen, but far more than 1987 when 167 singing males were observed. That was a low point. “The recovery plan goal was 1,000 breeding pairs, but there are now 2,090 pairs in Wisconsin, Michigan and Canada. Michigan has 98 percent of the population,” said Abby Ertel, the Kirtland’s Warbler coordinator for Huron Pines a Gaylord-based conservation organization. Her group is spearheading an effort to assure the birds have ongoing support once they come off the list. You might wonder what more is needed if the bird has recovered, but the yellow and blue warbler’s success story is directly tied to active human intervention. And most will tell you that intervention has to continue or the success to date will slowly but surely disappear. “The (endangered species) list is where species went to die,” said Brad Jensen, Huron Pines’ executive director. “You don’t often hear of species coming off the list – especially if coming off is dependent on humans. So, this is a great success story. 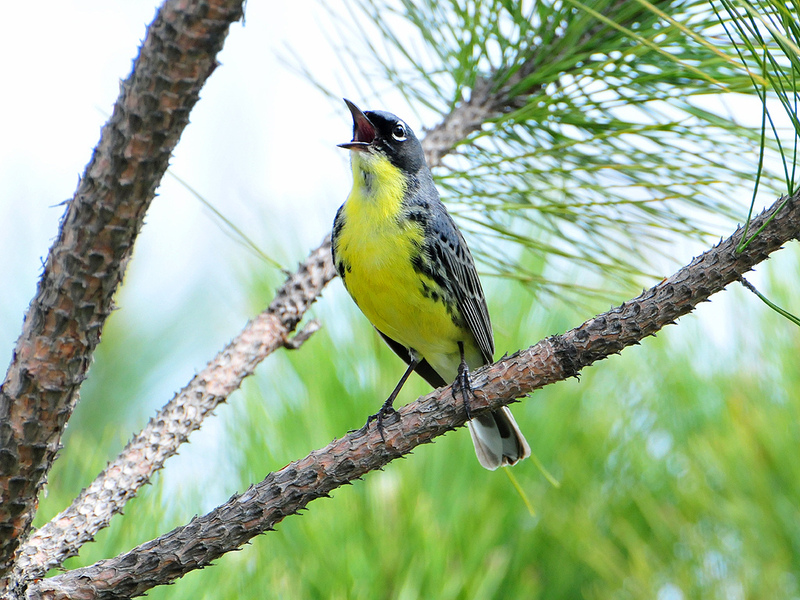 Kirtland’s Warblers have made a comeback in Michigan. Photo: U.S. Fish & Wildlife Service. And that, among other things, is because federal endangered species funding will dry up which may create gaps in management for the warbler. 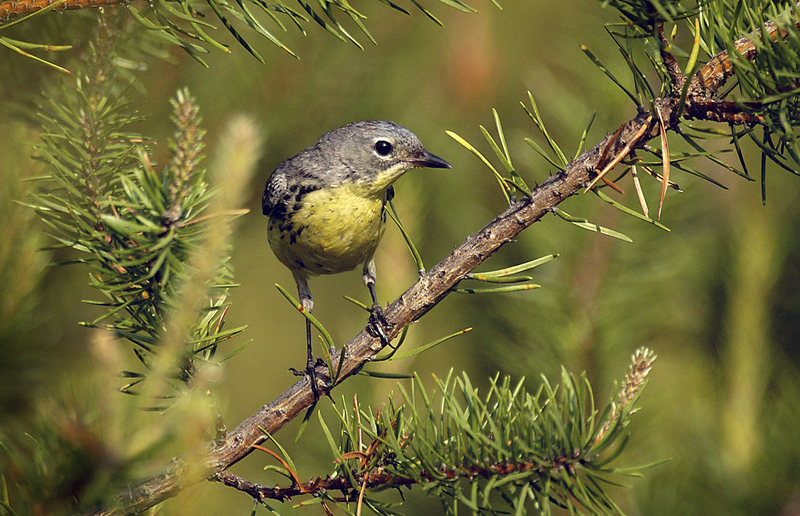 More than 150,000 acres of jack pines are managed now in Michigan for the warbler, which nests only under the lowest branches of four to 20-year-old jack pines. Older jack pines lose those protective lower branches and the birds do not nest in those stands. This is why jack pine acres are cut on a rotation to provide ongoing, right-age habitat. Trapping cowbirds has also been part of the equation. Cowbirds have developed a unique survival strategy. They were once denizens of grassland plains where they followed cattle and buffalo and ate the insects around them. They laid their eggs in other bird’s nests so they could move with the herds, leaving their young to be raised by foster parents. Cowbirds moved east into Michigan and other states as lands were opened up by logging and for farming. Today they are found all across North America and are known to lay their eggs in the nests of 220 species, according to the Cornell Laboratory of Ornithology. In Michigan, they use Kirtland’s Warbler nests among others. Cowbird chicks hatch earlier than warblers. That gives them a head-start. They are also more aggressive when it comes to competing for food. That, in turn, results in fewer warbler chicks surviving. Studies of their interactions show that one cowbird egg in a nest can reduce the number of warbler chicks that live; two cowbird eggs can result in no warbler chick survival, according to Michigan DNR. An average of 4,000 cowbirds are trapped and removed from Kirtland’s warbler breeding areas annually. The end result has been more warbler eggs as well as more warblers fledging the nest. Cowbird trapping, however, is not cheap. It costs $130,000 to $150,000 annually, Ertel said. The money comes from the federal endangered species program. It will disappear once the warbler is delisted. But you can bet cowbirds won’t go away. Enter Huron Pines which is working to bring public and private partners together to continue providing support for the warbler. Huron Pines received a $200,000 grant last July from the National Fish and Wildlife Foundation for development of the alliance and public education. In September, it was also awarded a $171,000 Great Lakes Restoration Initiative grant. Most of that money will go to the DNR to offset the costs of planting 2 million jack pine seedlings in Kirtland’s Warbler management areas, Ertel said. Ten to 15 percent will be spent working with private land owners who do the same. Huron Pines has also partnered with Michigan Audubon Society which is handling outreach and education about the effort. Meanwhile government agencies like the DNR and FWS are working on a warbler conservation plan that will replace the recovery plan once it is delisted. Kirtland warbler management on Michigan’s northern breeding grounds costs about $1.7 million a year, according to Ertel. If you multiply that by 10 or 20 years, factor in political uncertainties and changing priorities, it is not a stretch to see the endangered bird’s long term success will depend on more than government. This entry was posted in Uncategorized and tagged Conservation, DNR, Endangered Species Act, Environment, Huron Pines, Jack Pine, Kirtland's warbler, Michigan Audubon Society, Michigan Department of Natural Resources, National Audubon Society, U.S. Fish & Wildlife Service. Bookmark the permalink. 4 Responses to Kirtland’s Warbler makes a comeback, but what’s ahead? Tough when long term success of a species in the wild depends on ongoing intervention by humans – as in trapping cowbirds. Are cowbirds a problem in standing pine forests, or primarily in edge habitat? Barbra & Jack. More typically edge habitat, open lands, grasslands, but generally not thick woods from what I’ve been able to discern.. And yes, tough, indeed. It will be interesting to see how the KW initiative progresses with working to broaden the sources of financial support for ongoing management. Nice piece, Howard. What’s ahead for the Kirkland Warbler? Two things. First, massive sized horizontal hydraulic fracking, with it’s industrial sized operations, access roads, trucks, water removal, noise, odors, will collide across the same northern counties and state land that is home to the recovery of our state bird. Second, there are also designs on more “multiple use” of intensive nature in these same state lands, such as large scale intensive farms, possibly for biofuels. Must demand full disclosure of the magnitude of all that’ is planned or may be proposed, and start hold open dialogues with all of those affected, not tightly controlled meetings in which citizens and property owners or local governments have no opportunity to comment. Thanks for the comment Jim. If I recall correctly, the robin is Michigan’s state bird. There was a move afoot some yeas ago to make the Kirtland’s Warbler the state bird, but that idea never fully fledged. .